In looking at my posts over the last year, one might think I've gone all "Sew Early 19th Century" and abandoned my 18th century roots--which isn't true. 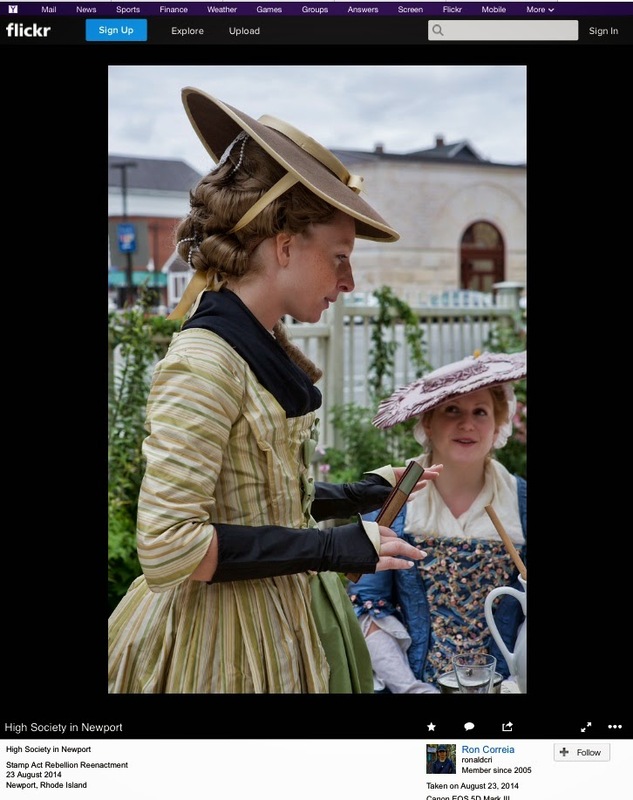 My sewing research has explored the addicting era of early 19th century gowns, but my professional work continues to highlight all things colonial. 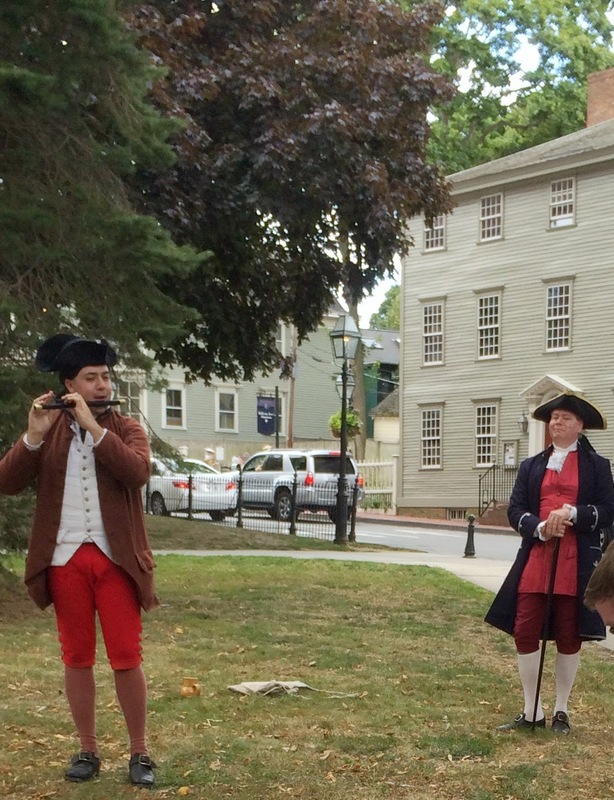 Last week my two history worlds collided (my work life and "reenacting" life) during the Newport Stamp Act Protest, a living history event that, I would argue, was rather unique. Nearly ten years ago my husband and I bought a reproduction "No Stamp Act" teapot on a visit to Colonial Williamsburg. I confess this was due to product placement. During a tour of the Wythe House, we saw the extant teapot exhibited and convinced ourselves we needed one for our mantle. 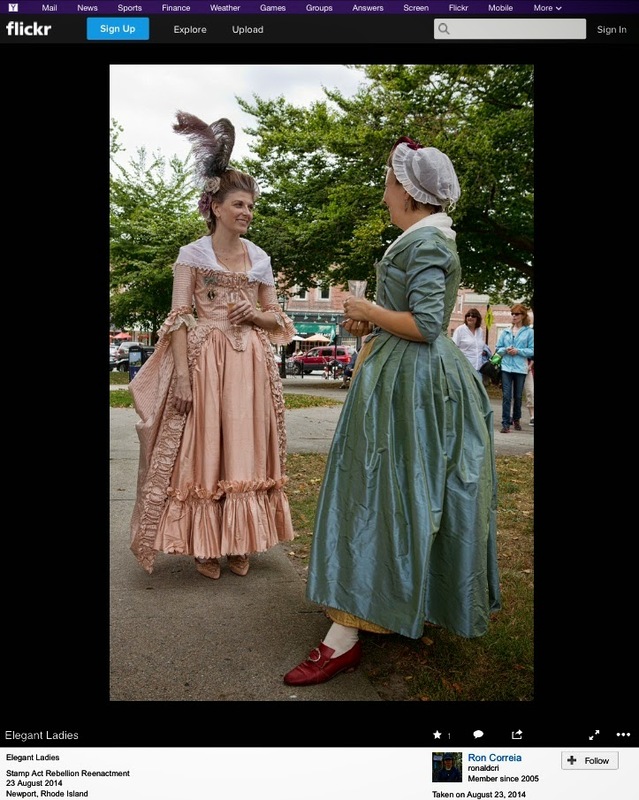 After moving to Newport, learning about the city's role in this 1765 event and officially turning into a costume history nerd, I wanted to do something to recognize Newport's role in the Stamp Act Riot...and use my teapot in a period appropriate manner. Next August will mark the 250th anniversary of the Stamp Act, and the relating historic incidents, making this year a good time to "warm-up" with a little protest. (I'm not a violent person, really.) Being the event organizer, I didn't get to take any photos (or even wear a period attire), but I have a few to share that my sister had taken...and I've borrowed a few from "RonaldCRI" on flickr. Two highlights of the event, which I believe are firsts for a New England living history program, we made an effigy and "ransacked" a house museum. Mr. Robinson (L) and Mr. Howard (R) at the Parade. My daughter dances down the square. Ms. R. and Mrs. B chat. 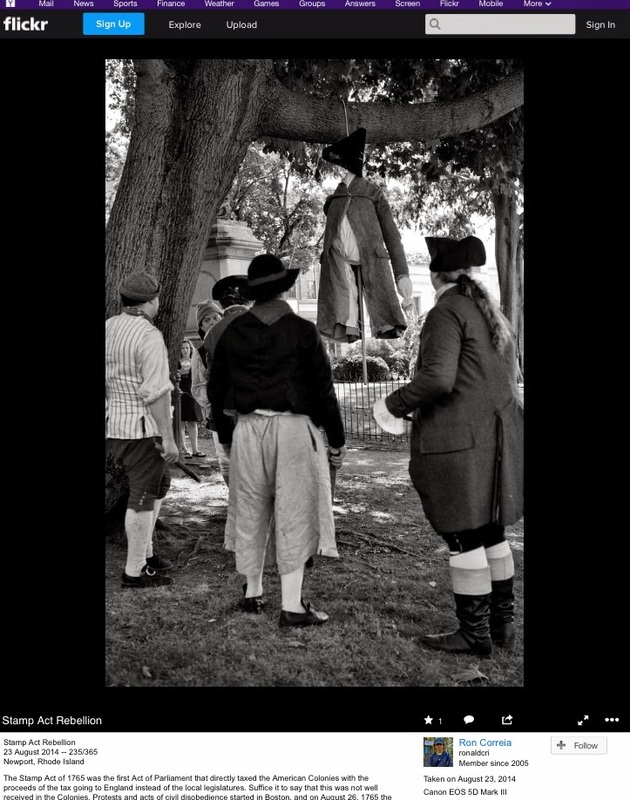 while loyalists Mr. Robinson and Mr. Howard overhear the news. Mr. Ellery (L) and Newport sailors admire the effigy of Mr. Howard. Kitty reviews the latest broadside with Mr. Vernon. Miss C. and Mrs. B. at the ladies tea. A panoramic view showing the heart of Colonial Newport, what is now called Washington Square. 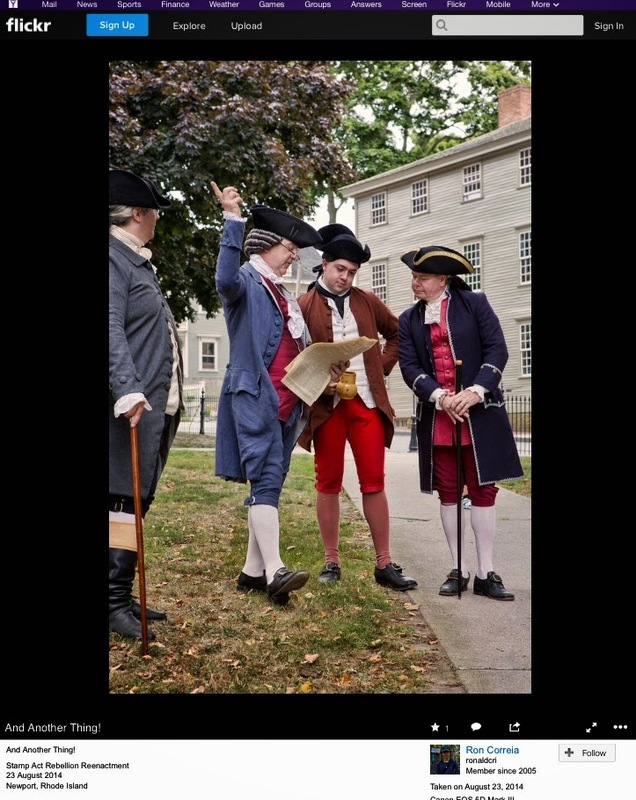 You can see the 1739 Colony House on the far left, the location of the ladies tea was at the building just to the left of center; at the far right Mr. Ellery chats with a visitor. The afternoon events concluded in front of the Colony House. 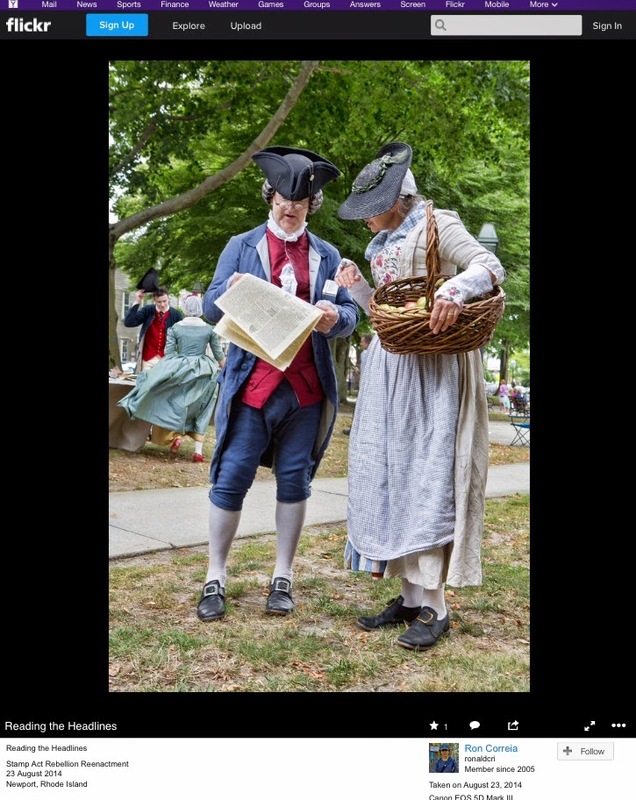 For more on the Stamp Act Protest, click here to visit Kitty Calash's review. There are more event photos on RonaldCRI's flickr stream; for the official event photos click here and also visit RevolutionaryNewport.com. And if you're feeling super history nerdy, I've complied a relatively comprehensive Pinterest board with Stamp Act research.